YES, water is good for you and you should drink plenty of it. Sometimes you want other healthy drinks besides water. I mean, after a meal, don’t you sometimes find yourself kinda wanting something sweet and tasty? Don’t get me wrong… I can eat a meal (or snack) and a glass of water will definitely quench my thirst and all. But sometimes that apple juice I bought for the kids begins lookin’ mighty tasty, sitting there in the fridge lookin’ all cold, crisp & refreshing! *tsk* *tsk* *tsk* – What to do, what to do? Well, there are actually quite a few things you can drink that will satisfy your thirst for something with some ‘flava’ and that’s what I’m going to share with you today. Now as an fyi, I do not claim this list is exhaustive as there may be other things out there as well. But these are things I, personally, have drank or currently drink, along with drinking water. These seem to be all the rage these days – infusing water with various fruit such as strawberries, orange slices, lemon slices, grapefruit slices, cucumbers, and even mint leaves, etc. and sipping on them. Basically, you are simply slicing up fruit and adding it to a large pitcher or jar of (filtered) water; allowing it to sit for at least 2 hours and then drinking it whenever you’re thirsty. They even have nifty water infusers available if you prefer your water with the FLAVOR of the fruit, but without all the particles etc from the fruit. One of my personal favorites is water infused with cucumber & lemon slices and strawberries. Mmmm… very refreshing and delicious! And not only is infused water a refreshing drink, but some recipes out there are also touted as being able to aid in slimming the tummy in one way or another. 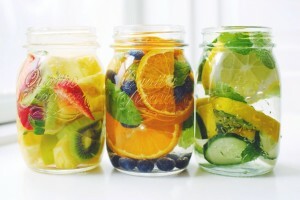 But slimming or not, the added fruit can take the “blah” out of drinking water. I LOVE lemonade! It’s probably one of my favorite beverages – tart with just the right amount of sweetness… Mmmm. And it’s so easy to make! Just squeeze a few lemons (no, you don’t need a crap ton of ’em) I generally use about 3, add a (natural) sweetener of choice (I tend to use xylitol* or natural evaporated cane juice sugar) and add some water, a cup at a time and keep tasting it to make sure it doesn’t get too watery for your particular tastes. You can even puree some strawberries and stir that in for strawberry-lemonade! You can also use blueberries, raspberries, or whatever you like. And don’t be afraid to try it with limes! Some say limes are too bitter, but they also make a tasty, refreshing beverage when made into limeade! *A word about xylitol: Xylitol is a sweetener that is said to be good for the teeth, and is a main ingredient in many dentist-recommended toothpastes and chewing gums. When purchasing xylitol, if you have any aversions to corn, be sure to check what it is made from, as some are made from corn (typically non-GMO). But some are also made from birch, such as the Xylitol I use. Xylitol can be used cup-for-cup in place of sugar and leaves no unpleasant aftertaste. Okay, some people (maybe even YOU) may think I’m weird for this, but I absolutely LOVE the Master Cleanser lemonade drink. 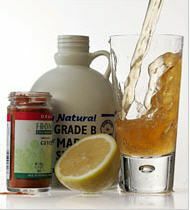 If you’re not familiar with The Master Cleanser, it’s a type of “detox/fast/cleanse” where you drink this lemon, water, grade B maple syrup, and cayenne pepper concoction ONLY, for 10 days, and it’s supposed to cleanse and detoxify you and many lose weight as a result. But the point is, I developed a fondness for the taste of the lemonade drink in fact, my husband and I BOTH love it!! I’ve made it by the pitcher-full, adding enough maple syrup for it to actually be sweet and tasty, and enough lemon to make it more tart than the actual recipe for the cleanse calls for. It can be a might costly to make on a regular basis, as the maple syrup isn’t all that cheap… but if you can find a natural food store in your area that sells it in BULK, you can typically get a previously-used bottle refilled for a fraction of the off-the-shelf price! I’ve never been much of an iced tea or sweet tea drinker. It wasn’t until later in my adult years that I even started to kinda-sorta like hot tea. But with iced, I’ve tried multiple times, but it’s just not MY cup of tea (yeah, pun intended). However, I know a lot of people who DO love it. Now, I won’t get TOO much into this because of the fact that I don’t drink nor make it, but I would assume it safe to say that store-bought brands are probably NOT the healthiest of choices. To make it a healthy drink, I’m pretty sure you’d probably need to make your own, using sweeteners other than refined white sugar (such as the ones previously-mentioned for making lemonade) and natural herbal tea. 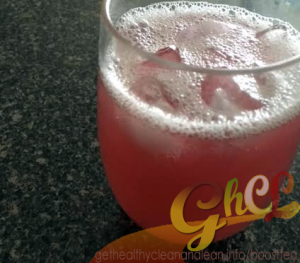 Now this is a delicious beverage that is not only a tasty, refreshing alternative to water, but it also has quite a few other benefits such as: curbing your appetite, reducing your cravings, and boosting your metabolism! Boost Tea is a tea, but don’t be fooled… this ain’t Lipton! It doesn’t even TASTE like your standard tea. It tastes more like one of those powdered drink mixes that kids love so much (you know the ones) and while both flavors (passionfruit & strawberry lemonade) are delicious, the strawberry-lemonade is my absolute favorite! Like those drink mix beverages, you drink Boost Tea cold. But unlike powdered beverages, it’s actually GOOD for you and doesn’t contain sugar so even if you’re diabetic or low carb, you can enjoy this healthy, tasty beverage! So there you have it… healthy drinks besides water! Now, please don’t view these suggestions as REPLACEMENTS for water, as drinking actual water is very important! But for those in between times when you just want something a little more, refer back to the 5 healthy drinks other than water that I shared with you today!